Time to update the learning spaces, and so here is a little tour of our current arrangement.We are very blessed to have a home with an in-law suite, and in-laws who are very happy with their own homes! So, that space is dedicated to learning and creating. If I had it to do over, I probably would consider painting the walls white, and not hanging curtains, but when we bought the house 5 years ago I was in a hurry to get rid of the teal walls! 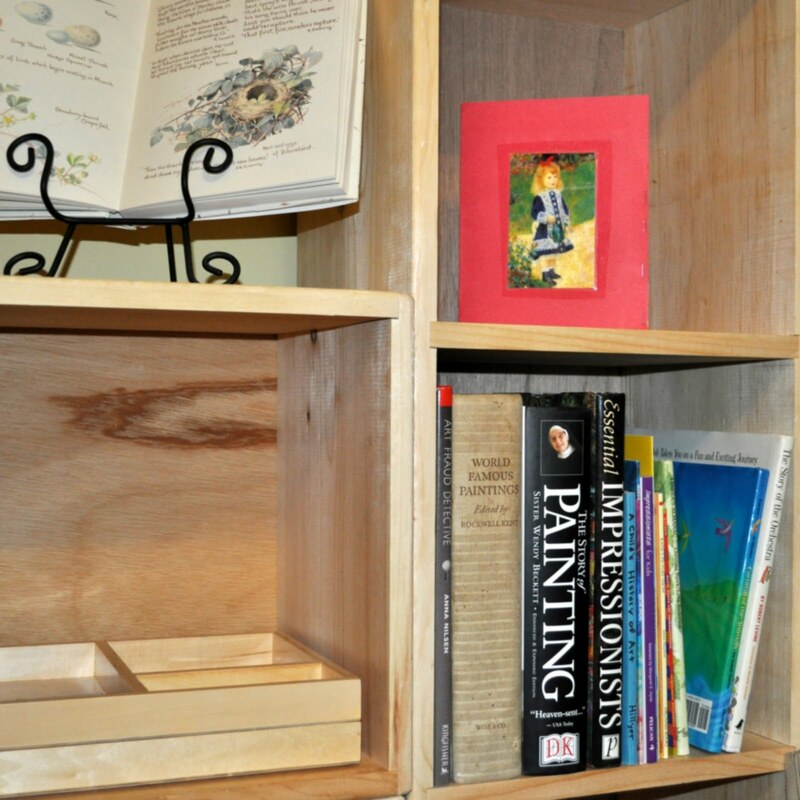 Last year I moved the dark shelves out and replaced them with these wooden cube units - they make organizing books by subject much simpler, and allow for storing and displaying items other than simply books. I am still on the fence about the bulletin board. I got it on Craig's list, so it wasn't a big investment, and I am tempted at times to just remove it. For now, we will keep it, and use it to display our composer and artist study, as well as a map of the continent we are working on in geography studies. 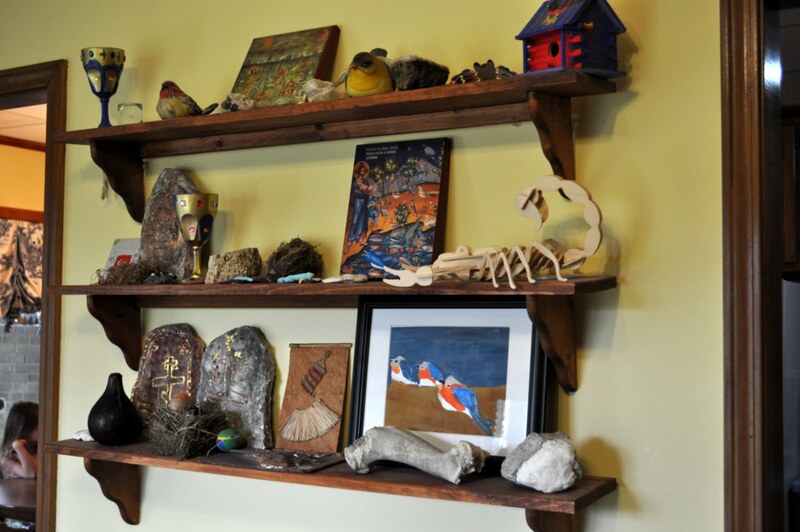 Our felt saints live on top of the shelf as well, where they often form themselves into various interesting scenes. Generally speaking, geography and reference books are on the far left under the globe, then history and Christian studies books. Then our wonderful selection of read aloud living science books. 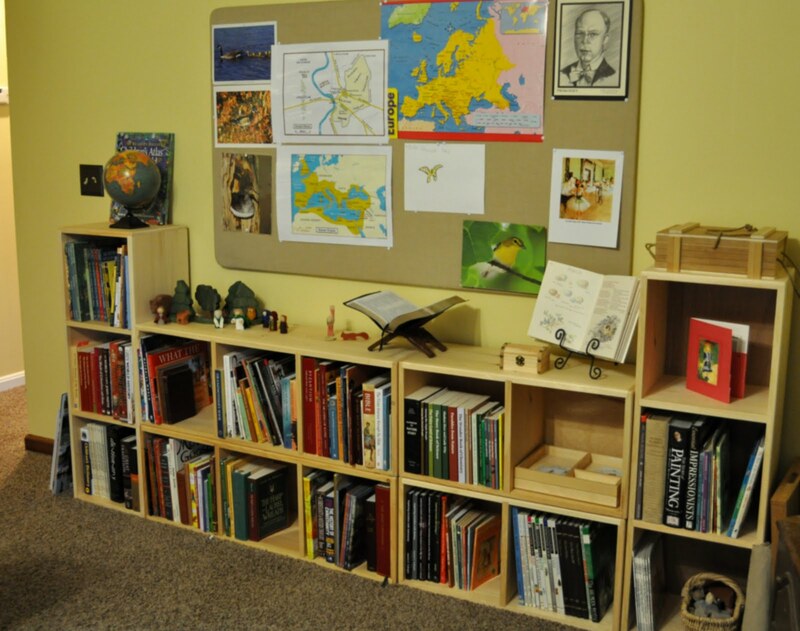 The far right cubes contain art studies, including art reference books, some Montessori 3 part cards, art games and a set of Child-Sized Masterpieces. The beautiful book on display on top of the shelving is a copy of The Country Diary of an Edwardian Lady. Taking a tip from Jen, I enjoy having it on display throughout the year. The illustrations are beautiful and the kids enjoy reading about each season. I have been using the cubes for the kids for a few years, but this year I really expanded each of their personal areas. Here is the crocodile hunter's space with room for his books, notebooks, new microscope (a Christmas gift) and his nature journals. He doesn't do a great deal of work at his desk, but it is nice for some things, and allows him to have his own personal space. 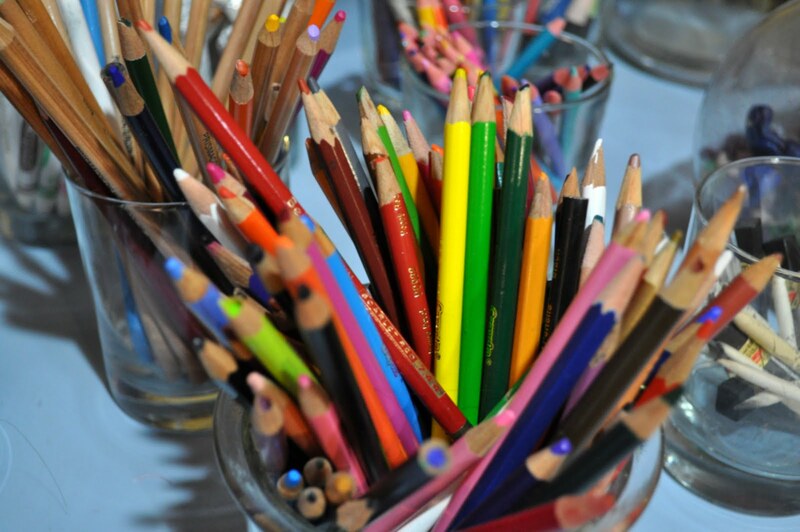 Each child has a set of pencils or crayons that stays in their desk as well. The futon is command central for me - that is where I tend to work with the Queen on her reading, and where our read alouds take place. It was especially nice to have when I was still nursing a baby! Above the futon is a set of shelves I hung to store the various found items and craft projects that needed a home. They stay on display until the dust reaches an intolerable level, then it gets cleared off and cleaned, and some things either find a new home or are discarded. On the table next to the futon is my basket. 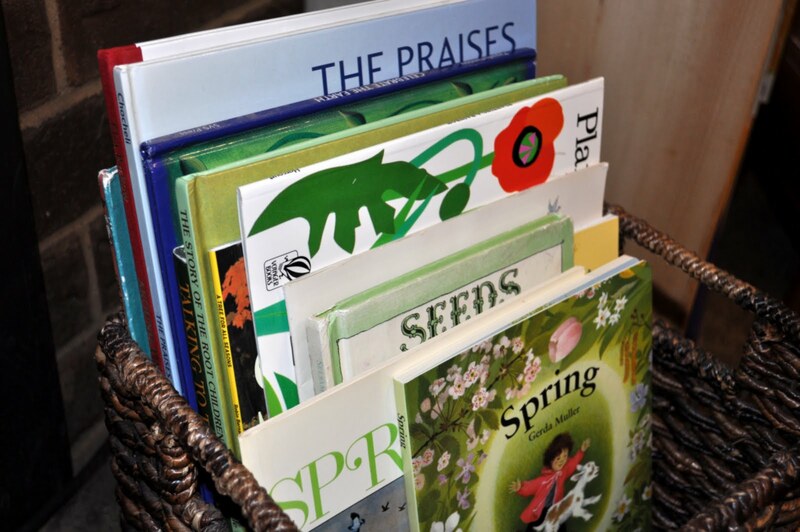 My basket stores our current readings, as well as a handful of teacher's guides that I need to get my hands on daily. Another Christmas gift was this art bench. 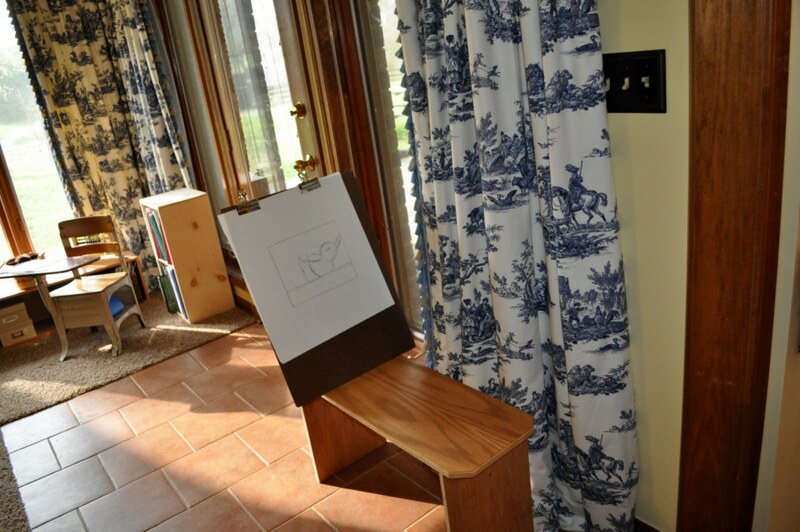 We have been using the Gluck Dvd art series, and the kids really like to have a bench to work at. It is light weight so it is very easy to move around, or to put in a closet if it gets in the way. This is the Queen's desk. I really didn't need a desk for her, but she insisted, so I hit Craig's list and found one for about $25. Beside the desk is her cube tower with her books and letters. Behind the desk you can see my do-it-yourself fairy tree with puppets for her math lessons. 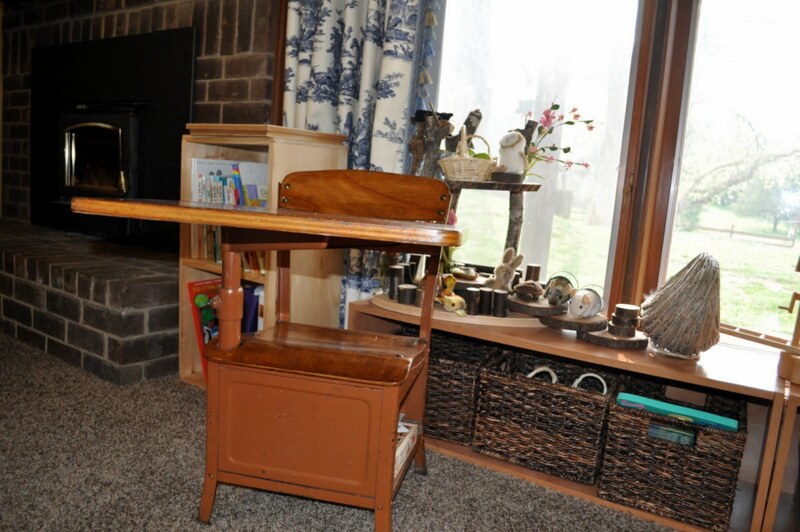 The baskets underneath contain various learning items such as an alphabet puzzle, acorn counters and a clock for learning time. A seasonal basket of books sits in the floor, and I change it out every few months using ideas from Matushka Emily and others. One way I have simplified this is to have a shelf in our back storage room with picture books organized by seasonal theme. 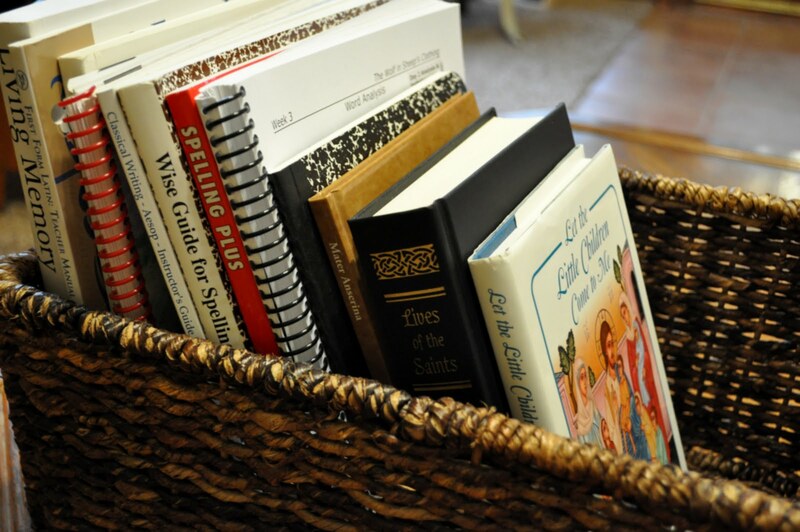 I include our saints picture books in this basket as well as nature books. Then I can easily change these out without spending hours searching for the books. It limits access to them, but it also means when they appear, the kids get excited to see old favorites they haven't read in a while. 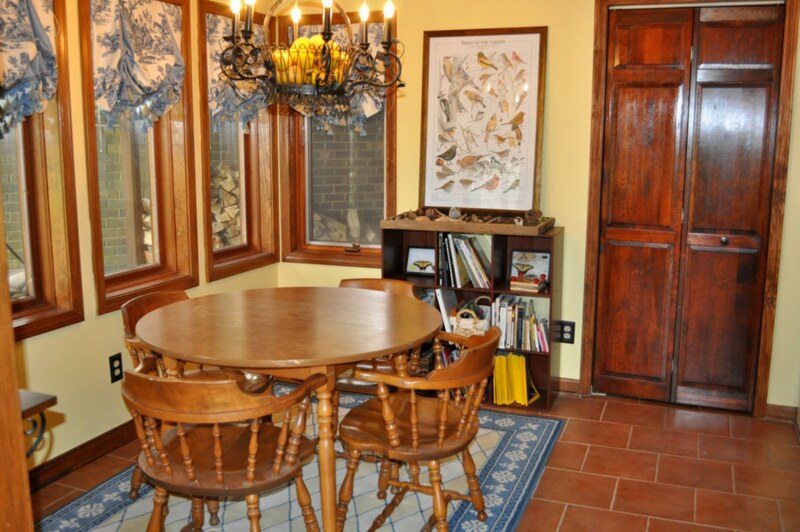 Moving from the living room to the kitchen, our nature studies are focused in this area. 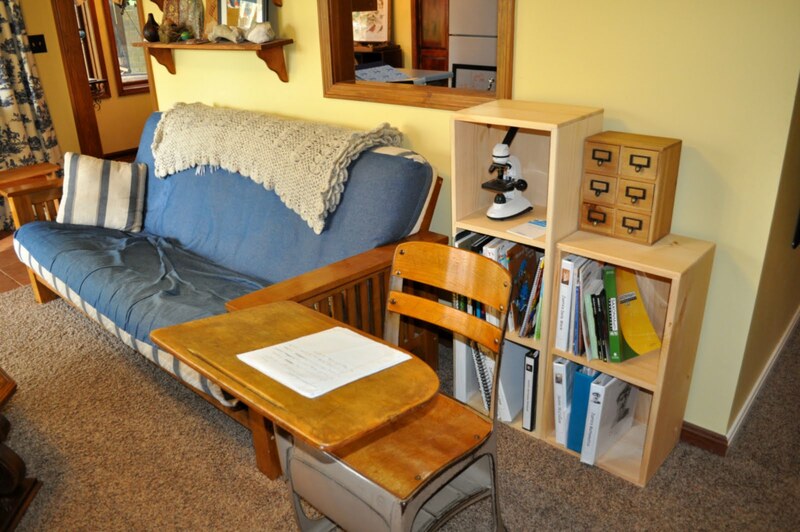 The table is a central work space for anyone who needs it, and is good for working on history portfolios, nature journals and anything else where you need a nice open space. Using inspiration from Ann and our science theme from last year I purchased a bird poster to hang over our nature shelf. 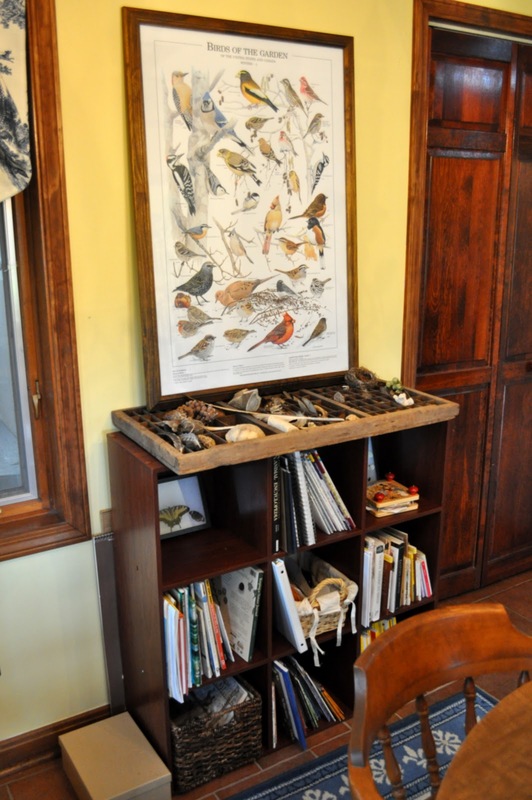 I also borrowed Ann's beautiful display idea for nature treasures - an old printer's tray from an antique store. 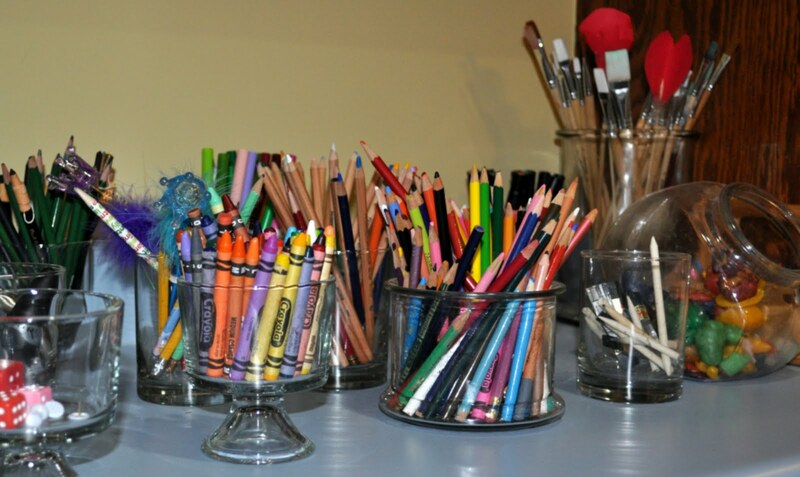 The kitchen counters hold our art supplies, another great idea from Jen at Wildflowers and Marbles. They are out of reach of the toddler who might do damage, but the older ones can get to them easily. 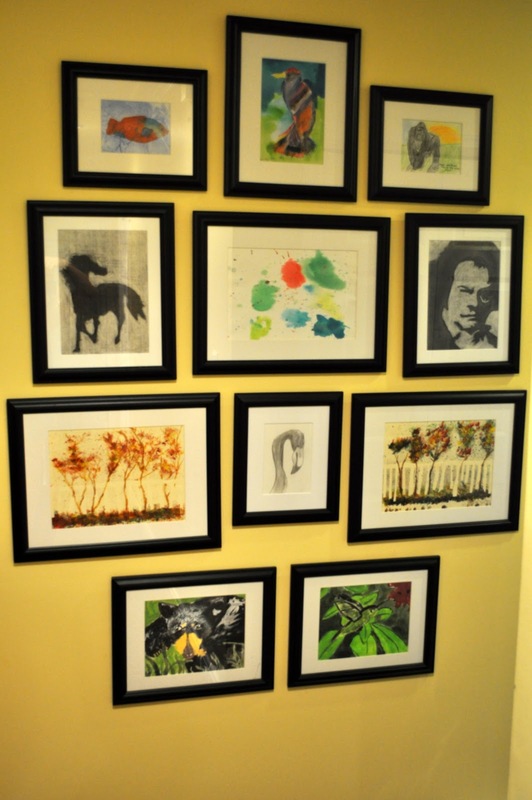 The nicest works are framed and hung in the hallway. Well, that is about it! It has changed a lot in the past few years, and I am sure it will continue to evolve as the children grow and our needs change. My final thought, (if you are still actually reading all of this! ), in the interest of "keeping it real" :) as Matushka Anna would say, no, it doesn't always look this great. 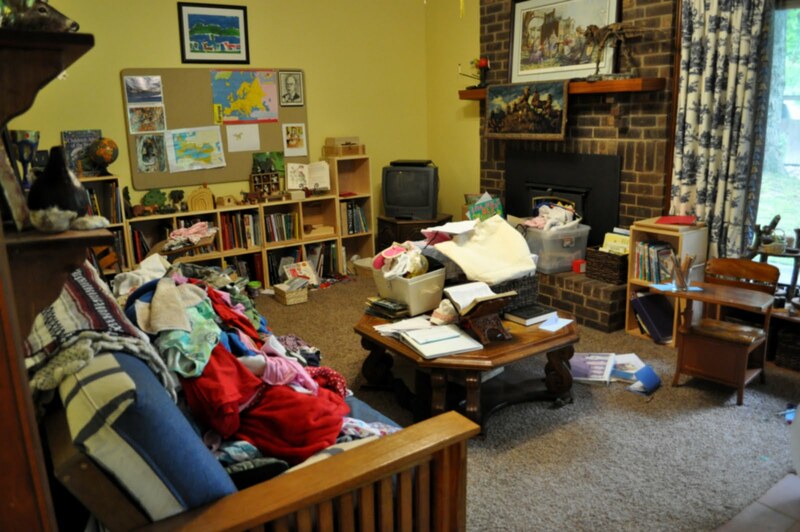 In fact, the futon is often the dumping ground for unfolded clothes, and since I am currently in the middle of a massive overhaul of our home (the learning area being the last I plan to tackle) it also has recently been the landing site for all things that still need organizing. Having taken two back to back trips in the past 10 days, here is what the room looks like today. Thank goodness we are taking this summer off from school! If you have a post of your learning area, please include the link in the comments, I love to get ideas from others! Wow! You have put a lot of time and effort into this! I know it is the product of many years of fine-tuning, but still...! thanks for the tour, it was lovely to see! That last one deserves the 'keepin' it real award' and I'm also in agreement that your space is a blessing. Our set up is pretty much exactly like Mat. 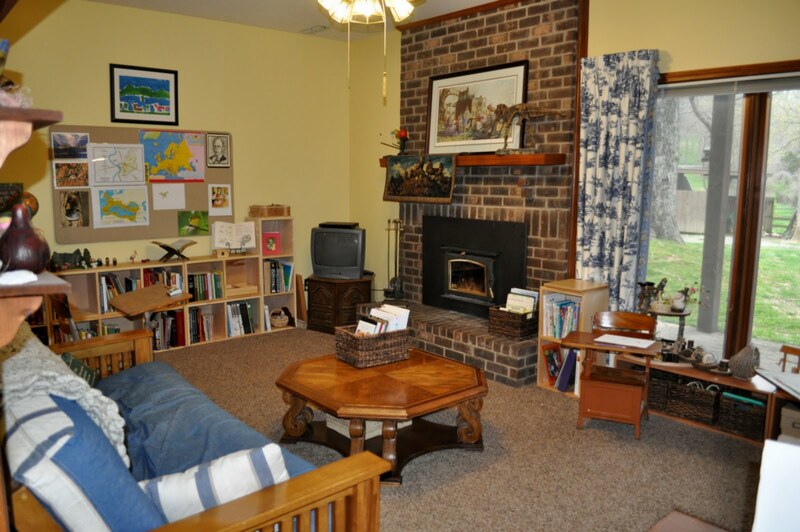 Anna's, a combo living/dining room area that is always flooded with books and other children related matter. How wonderful of you to post all of this, I see a lot of similar books and ideas and best of all enjoy seeing how you arrange things. Thanks again. You're right and I can't believe I forgot to go back and do this! Thank you! For sharing the room, and your inspirational ideas with it. And for also not making me feel hopelessly inadequate, by adding that last picture. God bless us all in trying, right? You're school room is so beautiful! 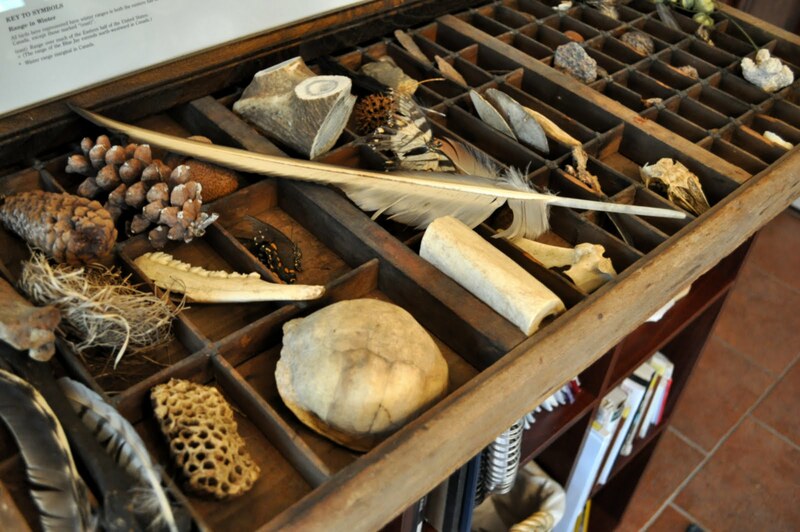 I love how you've organized it to display all of your wonderful natural science items. You've given me a lot of ideas... Thanks so much for posting your pics! Teal would've been a bad color choice for a schoolroom – you did well! The cubes look awesome – I covet the cubes :-) and the art bench, and a crayon and pencil holders, and the art gallery – I have nothing to contribute because I don't homeschool – I just want to say how amazing it is that you do this. The bonds you are creating with your children, the love you're sharing, the knowledge you're imparting – it's amazing. And thank you for sharing this. And God bless and keep you and all of yours Anna. What a wonderful space! I love the printer's box. Just wondered where you got those fabulous wooden cubes for storage. I've looked a few places but haven't seen anything exactly like it. How expensive are they? Cheryl - the wooden cubes are from a J*Ann's craft store - they cost about $25 for a 2 cube unit with their coupon. I slowly purchased them over the period of a year. The 3 cubes ones are just a little bit more - but I already had a few of them. In all, it cost about what decent shelving would have cost, but it did take a little patience to get as many as I wanted!